Nestled among the lush orchards of central Florida stands the pride of Jim Gearhart, owner of AAA American Storage in Groveland. His 87,000 sq. ft., multi-level self-storage operation, is one of the largest self-storage facilities in Florida and boasts some of the latest innovations and equipment available today for safe, secure, and efficient material handling and storage. Groveland’s population has doubled in recent years and has an abundance of lakes that provide numerous opportunities for boating, fishing, or just relaxing and watching Florida sunsets. Beaches, theme parks and shopping malls are not far away, but it’s the quiet life that beckoned Jim to make Groveland home. With people either on the move or just settling in, the area really needed an up-to-date self-storage facility that could provide both temporary and long-term secure storage for their personal property. After considerable site research and discussions with local community officials, Jim selected a location just off the main thoroughfare that conveniently connects Groveland with surrounding communities. Jim had previously been involved with building 8-9 other self-storage facilities having some 600 to 700 rental units each. That experience was instrumental in helping his plans for Groveland move forward. Partnering with experienced suppliers was essential. To achieve the quality and state-of-the-art facility that he was looking for, Jim selected U.S. 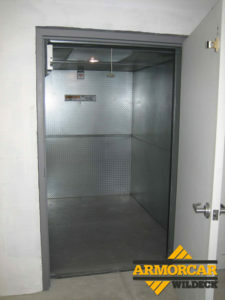 Door & Building Components of Orlando for self-storage facility construction and purchased the VRC material lift from AME Vertical in Troy, MI, a long-time representative of Wildeck® products manufactured in Waukesha, WI. Initial work on the Groveland facility began with site preparation and construction of three buildings, including offices and onsite living quarters for Jim. Work soon proceeded on some 200 rental units positioned for easy access around the perimeter of the site. Rentals of these standard units moved quickly so plans were finalized to build additional units and to move up, not out. The addition of 400 new rental units in the center area of the facility included a second level with 200 units served by a handicap-accessible elevator, two stairways and a 2,200 lb. capacity Vertical Reciprocating Conveyor (Material Lift) with a 6 ft. wide x 8 ft. long x 7 ft. high carriage. 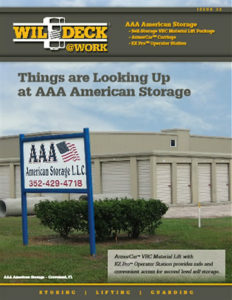 Moving up at AAA American Storage also meant offering deluxe, climate-controlled rental units which are in demand throughout Florida due to the warm climate. Units in the interior of the lower center section are ideally suited for climate control since they are more insulated from the sun’s rays and therefore less expensive to cool. “We have three buildings that are air-conditioned today,” states Gearhart, “and the largest units are 10 ft. x 45 ft. They can store rooms of furniture, cars and even a nice fishing boat. Our largest upper units are 10 ft. x 20 ft. and customers can move material to them easily at the touch of a button using the EZ Pro™ Operator Control Station on our VRC. 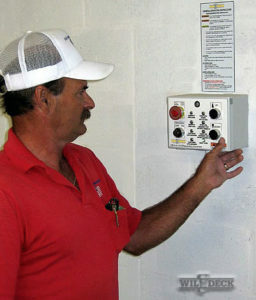 The VRC control has convenient status lights and is virtually ‘idiot-proof.’ A site manager can unlock it and train a user to operate it successfully and safely in a matter of minutes. The ArmorCar™ VRC carriage is also well lit, which customers like. In addition to interior lighting it has bright diamond-plate wall and floor panels that are maintenance free and add to the illumination. Adding a VRC that is both functional and looks good was very important. 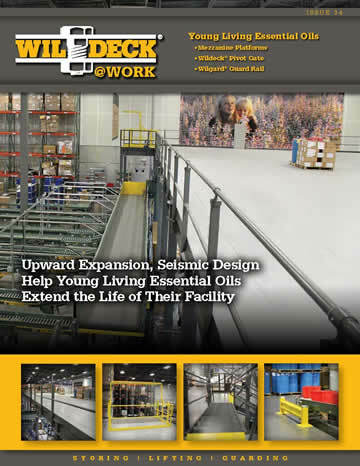 It gives our facility a competitive edge and cost a lot less than a large elevator,” he said. We know where to look for Jim. 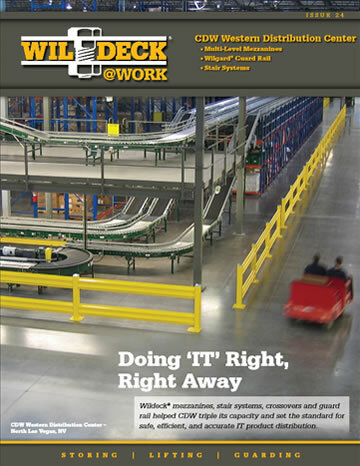 Wildeck products are used for the safe and efficient handling, storage, and protection of materials and personnel. For over 40 years, the company has grown through an experienced network of nationwide dealers and systems integrators. 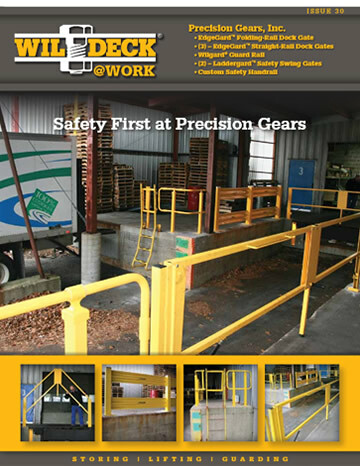 Wildeck manufactures guards, barrier rail, mezzanines, work platforms, lifts, (VRCs) and rideable lifts, access equipment, crossovers, rolling ladders, and handrail. 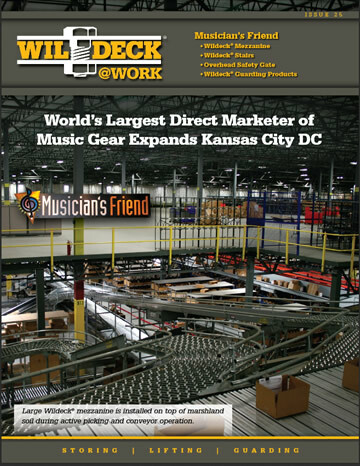 Wildeck is a subsidiary of Holden Industries, Inc., a 100% employee-owned company. © 2019 Wildeck. All Rights Reserved.